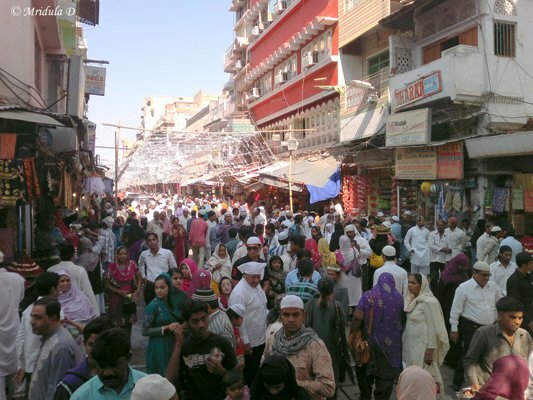 The auto driver left me in a narrow street in Ajmer and said I could walk straight to the Ajmer Sharif shrine ahead. When I looked at the crowd my resolve wavered but I somehow proceeded to the entrance. 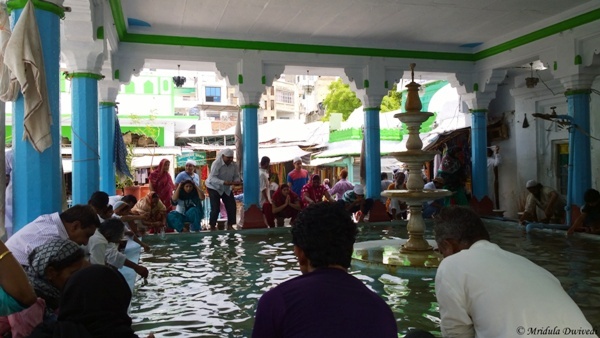 I came to the dargah from the Ajmer Railway Station. The auto driver at the station wanted 200 rupees for a round trip but I was not convinced. I hailed an auto going down the road and he asked for 60 rupees to which I agreed. While walking back from Ajmer Sharif, I went to a sweet shop, bought some sweets and asked the owner where could I hail an auto from for the Ajmer station? He told me it was 10 minute walking distance and the auto driver will take a circular route to make it look longer. I decided to test his theory. The railway station is indeed at a walking distance from Ajmer Sharif. Just ask for the way and you would get there! 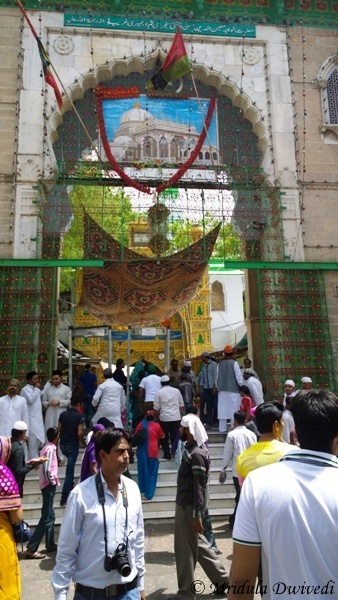 Getting Inside Ajmer Sharif: I was carrying my small backpack which had my camera, a few lens and all my valuables. A back pack or any other luggage is not allowed. The lady police at the entrance of the Nizam Gate was very polite and friendly. She told me that if I would walk 10 steps there is a government locker where I could keep my valuables. I could take my handbag in. My handbag had all the cards and money but I was not sure I wanted to leave my camera behind. After all, as far as material goods go my camera and my lenses are my most cherished possessions. 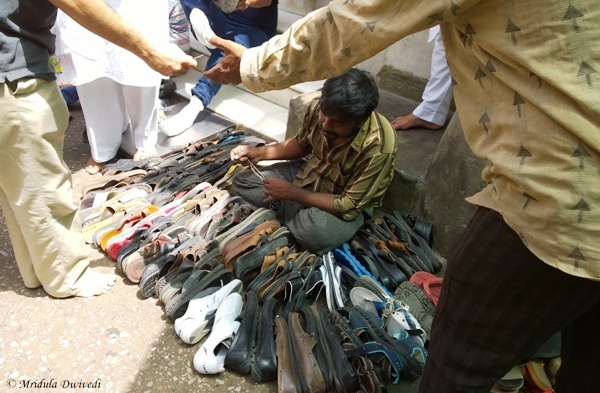 Not knowing that I could not carry my small back pack I had already deposited my shoes at Nizam Gate lockers (there are many), so I was moving about bare foot now! I entered the gate which leads to the locker only to be told by a security guard that the locker was closed, there was construction going on. This gate leads to a few banks, a railway reservation center and the locker. I disregarded him completely. And lo and behold the locker was open, I had to cross a small construction site that was all. While walking back I gave that guard a piece of my mind for trying to mislead me and walked away. I had sneaked in my camera in my hand bag but I could not lie to the police lady at Gate 2 when she asked me if I had a camera in my bag? She advised me to leave it at the same government locker but I was extremely reluctant. She told me people do it routinely. At this point I was simply willing to give up. I decided to go back and take my stuff and walk away. But when I reached the locker again I asked the young lad (must have been half my age, very baby faced and innocent looking chap!) if I could leave my camera behind. He of course remembered me. I don’t think he gets too many solo Indian women travelers. He picked up and showed me a few cameras already in his possession! That gave me some confidence and I gave him my camera for safekeeping too. He readily modified my receipt of left luggage and charged me 20 rupees (10 for the bag with lenses and 10 for the camera) for both. 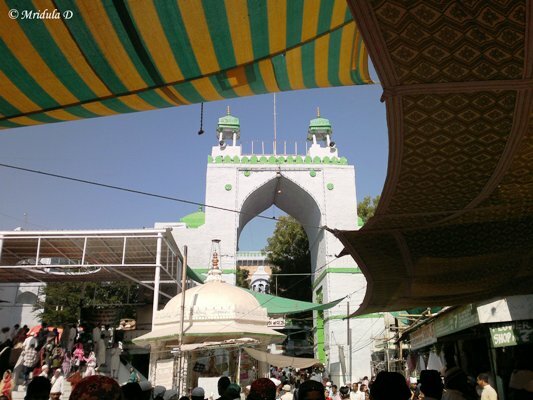 I walked back to the Nizam Gate and entered the dargah this time without any trouble with my hand bag. They allow you to take your cell phone inside. 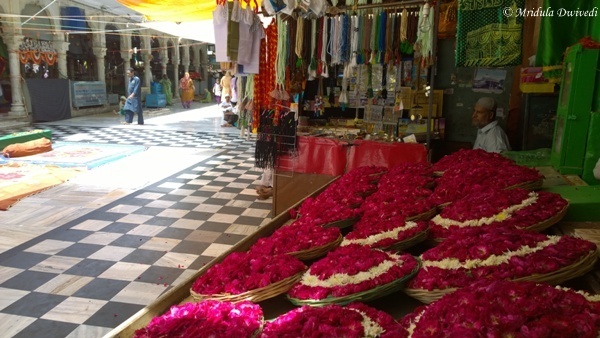 Inside Ajmer Sharif: As I was walking barefoot my feet were a mess. But there is a water tank inside where you can clean your feet before entering the main shrine and I happily cupped water in my hands and washed my feet. As I started walking inside a young official asked to cover my head! I know of many religious places where this is required but somehow I had nothing with me here. I told him I had nothing to cover my head with! He waved me off. 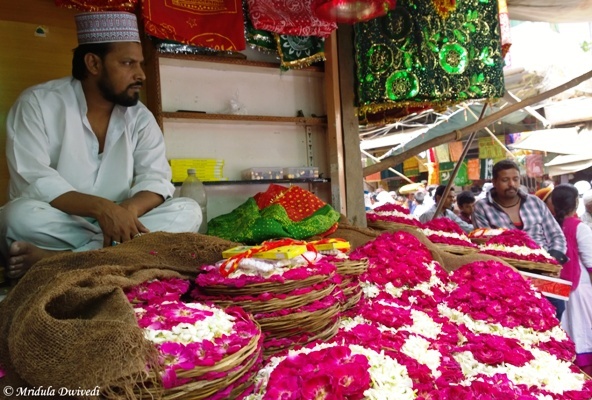 However I had no wish to offend anyone and I noticed shops inside the dargah too. I purchased a white handkerchief and covered my head. It cost me rupees 20. 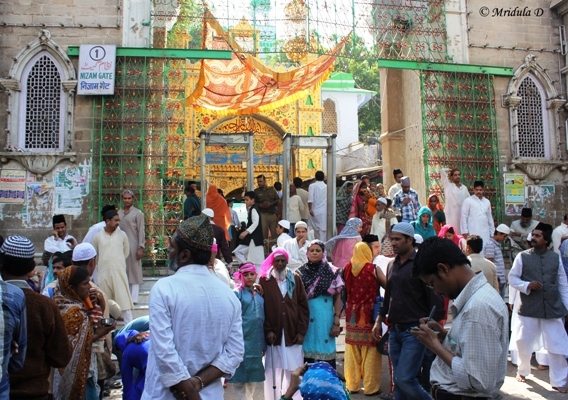 There were a lot of women on one side just outside the main entrance to the dargah offering prayers. 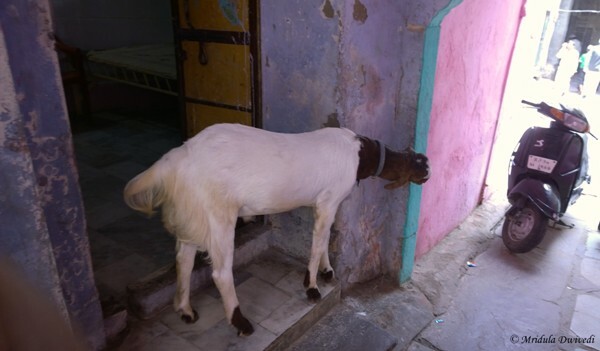 I could see a lot of threads tied to the jali. You come back and untie them if your wish comes true. I asked a lady if women were permitted inside the actual shrine (at that point the queue outside was all male which made me hesitate) and she said yes I could go. 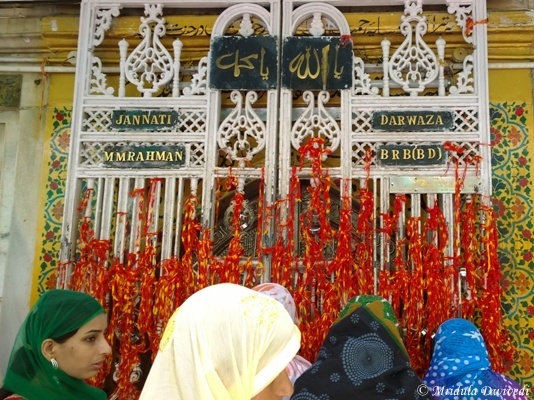 The picture below is after you walk inside the gate but not of the main shrine. Inside the Main Shrine: It is really crowded where the actual shrine is, the claustrophobic, shoulder to shoulder without any breathing space kind of crowded. I don’t know how I ended near the officials who bless you. One of them invited me inside the chadder and blessed me. It would have been a beautiful feeling but for the money exchanged involved and demanded. I was still fine but when two other officials insisted on giving their blessings, I was a bit dazed because it involved money every time! I wish I had my wits around. 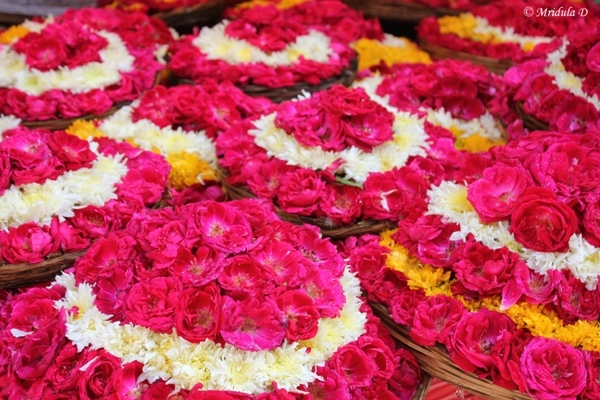 Usually I am quite vehement in a Hindu temple but being in a dargah I was just not sure what was the correct behavior. At one point the handkerchief that I was using to cover my head dropped and a guy caught it before it could fall to the ground and gave it back to me. In that crowd I don’t know why this was a very intense experience. I tried to wade through the crowd and exit from the next gate but I panicked mid way and got out the same way I came in, the wrong way. I am sure the Gods will forgive me for it. I could just not take the throng of humanity anymore. 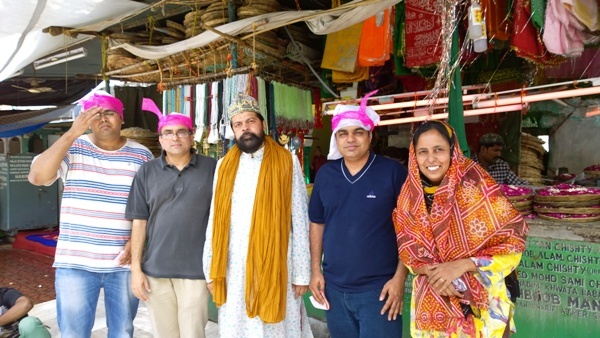 It was only after the visit I realized that the shrine of Hazrat Mu’inuddin Chishti is known for making a wish. They say if you make a wish here it is granted! I went simply to visit, I did not wish for anything. These days I have anyway left it to the Gods to decide what they want to grant me, after all I cannot better their decisions? It is also less complicated that way. But now that I know better maybe I will make a wish if I end up there another time! Getting out was relatively straightforward! I got my shoes within no time and put them on while standing and doing some acrobatics because of the crowd. I headed back to the locker and got my camera and the bag without any trouble with everything intact. As I said before that while walking out I bought some sweets and got to know that the Ajmer Railway Station was at a walking distance. From another shop I bought Rajasthani dresses (lehenga) for my niece and my daughter! 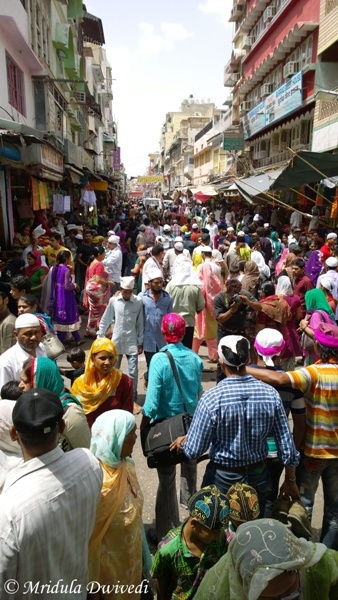 When I was talking to my sister immediately after the visit (while waiting for my train at Ajmer station) I told her never again as I don’t like getting stuck in crowded places. But now that a few days have gone by, I think I can do it again knowing what it is going to be like. If I go again I would make sure that I only have my handbag and my cell phone and no other bag. I may not enter the main shrine again or who knows I may go knowing what is there in store and actually make a wish! My father had been at the shrine in 1968 and when we compared notes he said it was not crowded then and there was no demand for money in those days! PS. Only while searching on the net I discovered that Ajmer Sharif is so popular that Bollywood stars regularly visit it to make a wish!